In the midst of planning a wedding, it's often times that personal care and pampering is pushed aside in the midst of ironing out all of the details. We believe that the journey towards the celebration of partnership and union should involve minimal stress, and deeply indulgent self-care in order to approach the day with clarity, ease and radiance from the inside, out. As modern day rituals evolve and weddings become much less rooted in tradition, we've found that there is a longing for resources, services, products and specialists that meet today's growing demand for a more holistic approach to wedding season - especially on a local level. And as we've grown our natural-based skincare products and recently introduced Vapour Beauty, a line of organic cosmetics, we've seen a shift in conversations among our customers, women especially, that have expressed their long-time desire for these products to pamper themselves personally and for their special day. Richmond is full of talent, and with so many being friendly faces that frequent and work within our space, we decided to extend this approach beyond skincare and pampering to florals, sweet indulgences and the like that cater to the holistically-minded bride and groom. 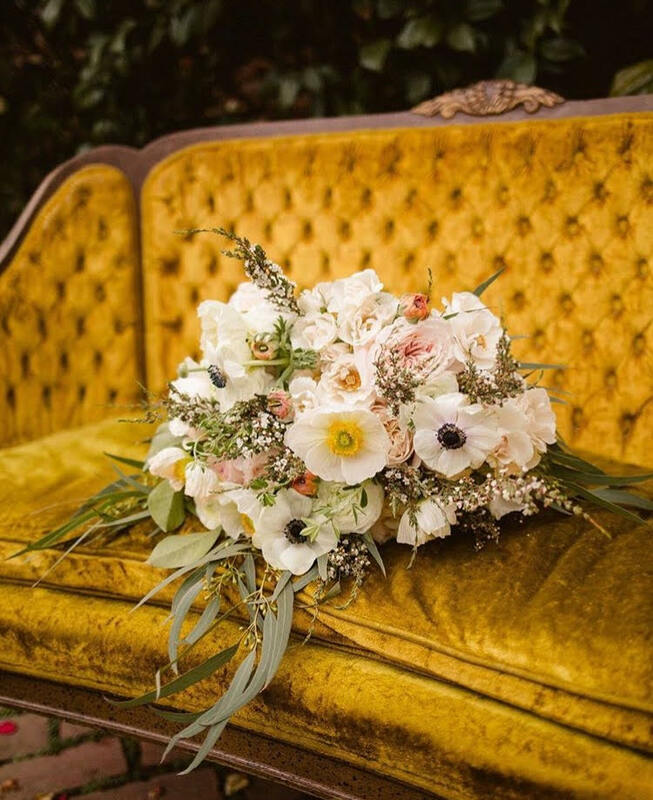 Rhea Calpeno of Photosynthesis Floral Design | This boutique floral design studio is known for their refined, organic style and commitment to sustainability, sourcing flowers that are in season and locally and domestically grown using sustainable and fair trade practices. Rhea's approach to florals can be considered both wild and cultivated, and we tend to agree, as we've seen her in her natural element through various workshops that she's hosted in our space. She sees floral design as an impermanent form of sculpture and is particularly inspired by the movement each bloom or green creates. Furthering her commitment to sustainability, Photosynthesis lightens their environmental impact by avoiding floral foam, composting our cuttings and recycling all flower packaging. View her gallery of custom work for inspiration and awe. Summer Alexander of Apothecary Richmond | We consider ourselves very lucky to have Summer as our in-house esthetician, as she takes special care towards making her facial treatments uniquely custom, luxurious and deeply indulgent. Her personal skincare line, Apothecary Richmond, was born out of the desire to create simple, effective, and safe personal care products, while her skincare treatments are inspired by European facial services with focus on clearing lymph and reducing congestion in the tissue. Ingredients are chosen to address common skin care concerns, such as, fine lines, hyperpigmentation, scarring, and aging. She utilizes both her own products as well as other quality skincare products carried at Boketto to craft a system and routine that treats on an individual level. For more information on booking custom treatments with Summer, see our services page. Jelena Nikolajevic, Facial Acupuncture & Gua Sha | Jelena, owner of Boketto Wellness, is excited to extend her treatment offerings to include facial rejuvenation through acupuncture and gua sha techniques, which improve blood flow to the skin, promote lymphatic drainage, reduce puffiness, dark under eye circles and stimulate pressure points for supple, toned skin. A wonderful complement to regular facial treatments to deepen and enhance the skin. Mariah Najdawi, Private Makeup Consultations | Mariah has been offering private makeup consultations for a while, but took a brief pause because she felt that there was a lack of natural, organic-based cosmetics available. When we expressed our interest in having her demo and perform mini consultations to celebrate the introduction of Vapour Beauty, she was turned back on and is now open for wedding day makeup consultations and applications to offer brides a more natural, chemical-free approach. If you're interested in services with Mariah, please contact us here. Sidney Hall of Moon Maidens Delights | This entirely gluten-free and vegan bakery based in Charlottesville, VA creates the most divine sweet indulgences with high quality organic ingredients, love and intention. Moon Maiden's vegan and gluten-free pastries are quite different from what you will typically find at conventional bakeries, as ingredients are chosen based on nutritional integrity and robust flavor. Sidney works with individuals to craft special occasion cakes and treats using unique flavor and ingredient pairings and plant-based, freshly sprouted, whole grain flours, without the refined sugars. Explore some of her beautiful work and more information on her offerings here. Jessica Breed of Willow Knows | For brides looking for a modern and sleek second skin, Jess works with individuals to create custom raw silk bridal pieces and dresses. Her approach to design explores an intuitive, experimental way of working to create pieces that can be seen as unique objects and that are truly one of a kind...and absolutely gorgeous. To learn more about Jess and her unique process, including samples of some of her custom pieces, explore here.